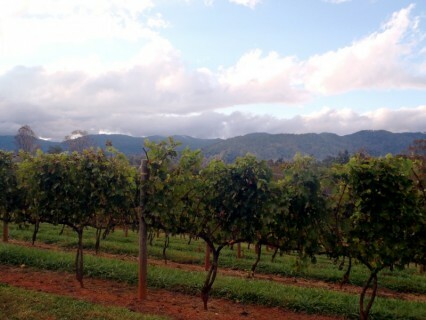 The dinner was hosted by 2013 WNC AgOptions recipient Addison Farms Vineyard at the farm’s new winery. Pizza Love baked pizzas with ingredients from local farms, including sausage from Calee’s Coops. Other food at the dinner included: salad greens from Walnut Cove Farms, cheese from English Farmstead Cheese, apples from Coffey’s Orchard, blackberries from Stepp’s Plants, and cider from Fruit of the Spirit Orchard and Vineyard. Reems Creek Nursery provided mums for the center of the tables and many other recipients donated door prizes such as honey, a rhododendron and eggs.